Oh, you poor-sweet-babies missing your mamas, I croon to the extra sets of eyes that keep constant watch over me. One friend’s dog and another friend’s cat are houseguests for a good part of February. It’s like having a houseful of kids again, I tell myself. I fill the fridge and hunker down for Pet Camp. Oh babies, you’re gonna exhaust yourselves, I tell them. Together with my dog, they follow me as I flit from room to room, from manuscript to mail pile, from computer to kitchen counter. They close in tighter anytime I approach the kitchen. The cat peeks out from her polyester cat-house parked on my desk when she’s not playing in the dripping bathroom sink. The houseguest-dog grunts at the extensive barricade system enclosing the carpeted living room. My own dog merrily tests out each of the extra nests lovingly installed around the house, distributing her chew toys among the various bedding options, like they might hold her place. The houseguest-dog has his own way of marking his places. Babies, it’s TV-time, I announce turning on the news, and they follow me to the couch where we rotate who gets my lap. It’s potty-time, I sing. Time for bed everyone. Who wants dinner? Major rush to the kitchen. Pet sitting is a great distraction from grief and worries. The more critters, the busier you can keep yourself. But sooner or later, when the pets are all piled into bed with you, and you’ve covered them up in your polar fleece jackets to keep them cozy through the night, you find grief is still there waiting. All the persons and things you lost come back to haunt you. The world is passing you by. Time’s disappearing faster than dog-chow. Other than visiting your mother, when did you last take a long trip? You think of your friends having fun times in exotic places, drinking strawberry margaritas on sunny beaches. Halfway into the middle of my pet-sitting weeks I call a tour company to book a vacation for myself. Three sets of eyes watch me hug the phone. Oh babies, I’m going to Australia! 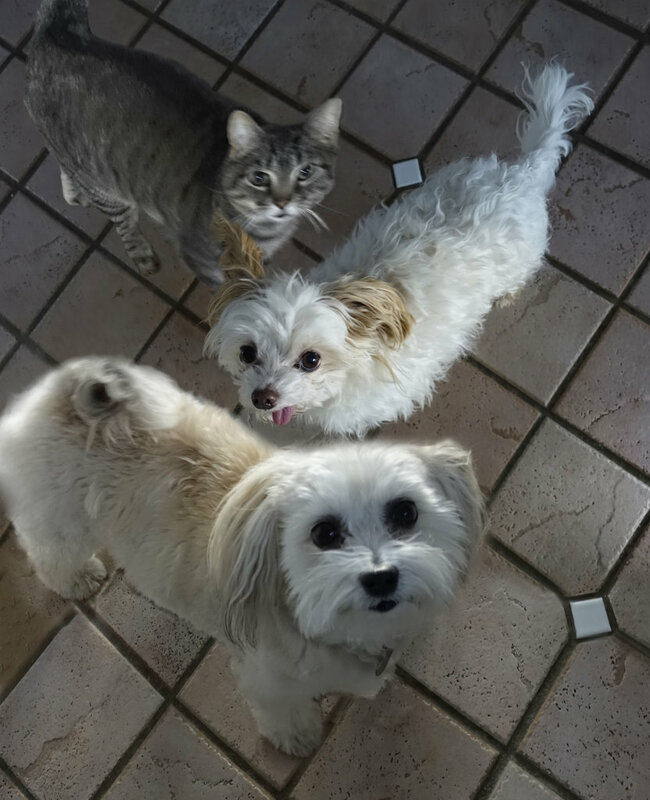 This entry was posted in 2017 and tagged distraction of pets, dog sitting, furry houseguests, Pet Sitting, pet sitting for friends, time for a vacation on 2017/02/27 by Robin Botie. Go Robin. To Australia, I mean. I love the adoring eyes waiting to see what you’ll do or give them next. I don’t long to travel, but I do long for a sense of teeming life. Lots of work happened on the land during the warm days. Seeds are ordered. Snowdrops shivering in the wind. I think if I had more things like gardening and landwork going on I wouldn’t be so eager to go off to Australia. You can see the world moving right in your own yard, Elaine. Seeds sprouting, trees budding, flowers blossoming, …life “teeming.” I have to go clear over to the other side of the earth to feel like life is still “teeming.” To feel like I can be “teeming” again. Wishing you more warm days. Robin, what an adorable photo! Another good message. Can’t say I’m missing those critters. Maybe my dog is missing the full house we had. Now though, my mind is consumed with thoughts of Australia. Almost as much as it’s filled with thoughts of Marika. Thanks, Annette.